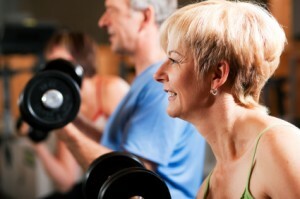 Whoever said that you can’t get fit and look great as a Baby Boomer? Well, it certainly was not Jane Fonda. Looking svelte and as beautiful as ever in her 70s, Fonda is a prime example of how taking care of yourself through proper diet and exercise can make you look and feel great at any age. In her video “Prime Time – Fit & Strong,” Fonda provides two levels of exercises that Baby Boomers and the elderly can perform while sitting and standing with or without weights. This video suits individuals who may not have worked out in a while, have stiff joints or who are completely new to exercise. The main focus of the video is that you are moving and burning calories in a controlled, safe aerobic workout that should help you avoid muscle and joint strain or injury. Many times Baby Boomers and those who are older may feel insecure about exercise, think it might be too strenuous or just have no interest in it and are therefore reluctant to give it a try. Throughout this video, however, Fonda maintains an encouraging tone that puts exercisers at ease. Her video will help you understand that you should not be ashamed of your fitness level but rather you should embrace the fact that you are moving and exercising. Achieving that movement is her basic goal. Senior health is very important, and because this is an exercise video, you have control over how much or how little you want to complete in a day’s time. The two segments work on strength and flexibility, with an additional feature of how to work on your balance. Throughout the video, Fonda offers pieces of advice for a successful workout and general approach to everyday life. As you go through these gentle workouts, you are burning calories and gaining strength and flexibility. These exercises can help alleviate joint and muscle pains and help you move around with more ease in your daily activities. As you become more familiar with the video, consider adding weights to build your muscle strength even more. Start with a light set, even perhaps a one-pound dumbbell for each hand and work up to heavier weights as you become stronger. Please consult your physician prior to starting any new exercise program. It is always best to make sure that you are first healthy enough prior to trying something different, especially if this is the first workout you have completed in a while.